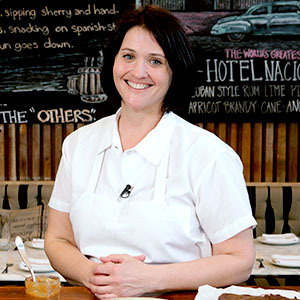 Chef Jane Soudah owns and operates Sweet Jane Bakeshop, an online baking company, and serves as pastry chef at Sunset Boulevard’s rustic and charming Eveleigh restaurant. Jane joined the Eveleigh team in 2014 and leads the restaurant's pastry program. Jane has a background in science and earned degrees in Food Science and Food Microbiology from Cornell University. Her extensive understanding of the chemical reactions and properties of food have given her a unique advantage when baking. When she’s not crafting delicious sweets in the kitchen, Jane loves cycling, going to the beach, swimming, and spending time with her four children.